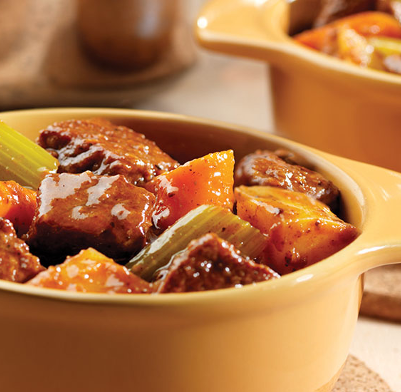 Adding V8 Vegetable Juice to your beef stew creates a rich flavour which goes perfectly with these hearty ingredients. Cover the pieces of beef in flour. Heat the oil in a medium-sized saucepan over a medium to high heat. Add the beef and cook through until brown, stirring continuously. Pour the fat away and remove the beef from the saucepan. In the same saucepan, add the V8 Orignial juice, broth, onion, bay leaf, thyme and black pepper and bring to the boil. Add the beef back to the saucepan and reduce the heat before covering and cooking for 2 hours. Add the carrots, potatoes and celery. Cover again and cook for another 1 hour until the beef and vegetables are tender. Remove the bay leaf and serve hot.